The young couple celebrating their 5th anniversary enjoy riding their bikes together. Her bike has to be purple as it's her favourite colour! But he would like something sleeker, in silver. 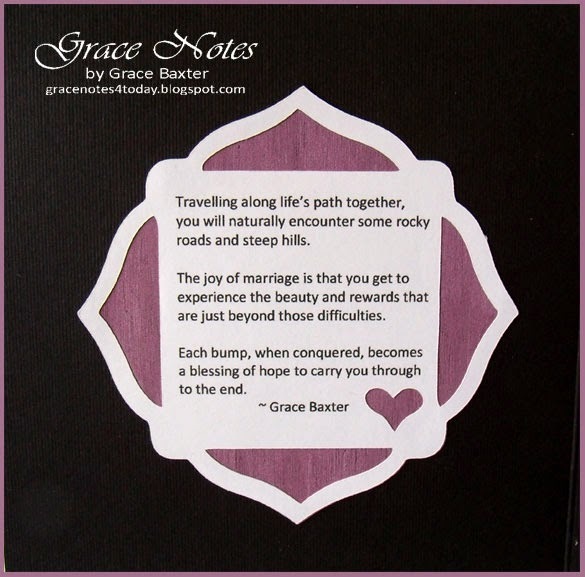 While designing this card, I was thinking about the two recipients and how they make such a good team in marriage. I hope this card brings a smile to their faces. Black cardstock forms the 5-1/2" square card. I used several layers to create the dimension. Top and centre is the bicycle built for two, cut from mottled gray. It's shadowed in purple-plum, matted on pure white that's shadowed in the same plum. I added silver sponging to the carrier for some sparkle. 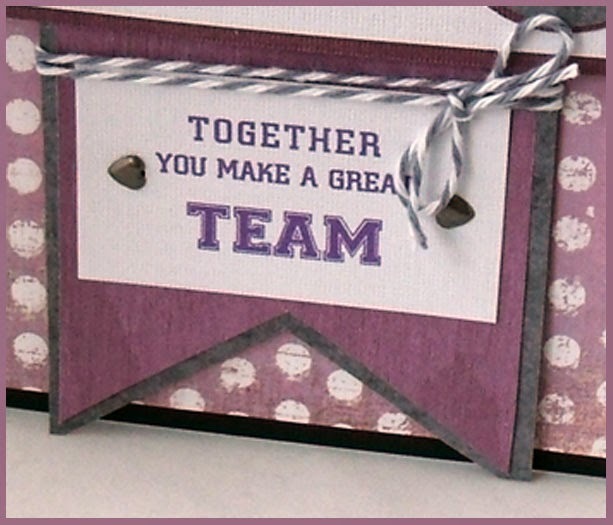 The vertical banner is cut from purple woodgrain paper, shadowed in gray. I created the sentiment on the computer, using fonts that are rather "sportsy". The banner runs the full 5-1/2" height. Little brad hearts and gray baker's twine finish off the banner. The right-hand Greeting panel mirrors the shape of the left side quote panel. This shape has really grown on me. It is the perfect blend of fancy and clean. And don't you love the cute little heart in the corner? 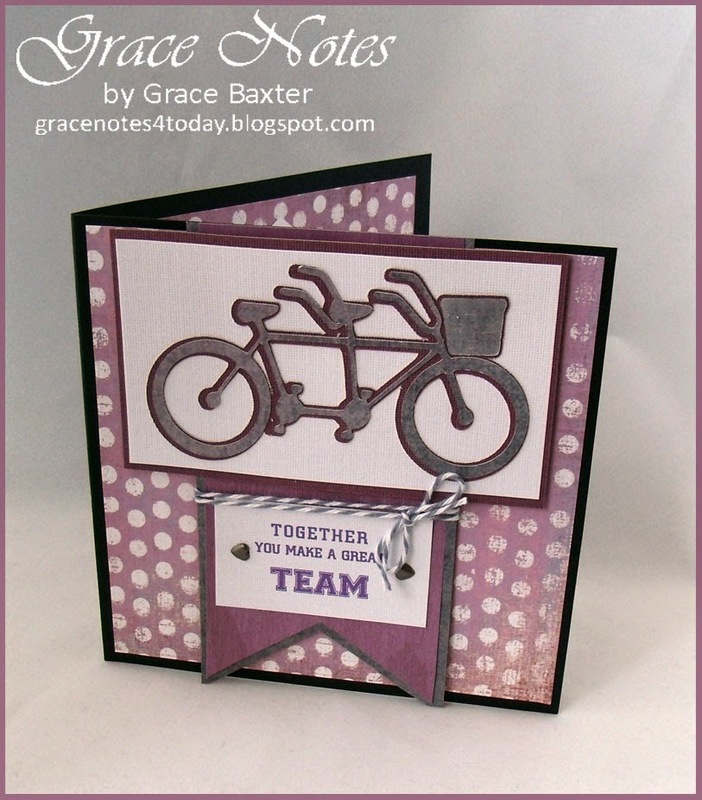 I used the same mauve vintage dot background as was used on the front. 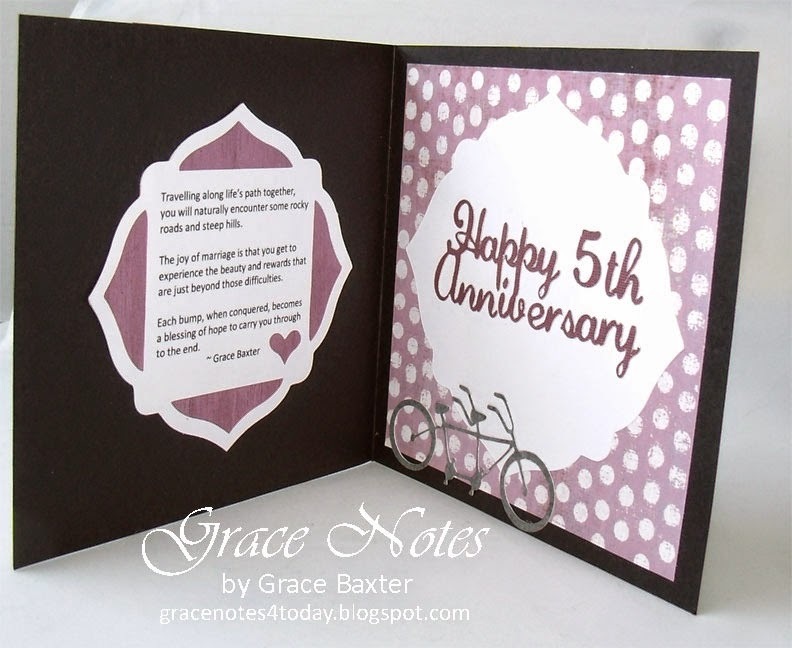 To make the "Happy 5th Anniversary" greeting, I designed the words with my Gypsy using the Quarter Note font. I love this font as it is cursive, yet thick enough to hold together well. The smaller bicycle reinforces the theme. For those of us who enjoy creating cards with the Cricut (whichever model), I'm wondering if I am the only person who is disappointed with the various "Happy Anniversary" phrases available on the cartridges. They are kind of cheesy fonts, or mismatched fonts -- and certainly not elegant. I find a better solution is to create my own sentiment or greeting using a choice font and the Gypsy. It's not always perfect, but certainly better than the alternative. I'd love to hear from any of you who make your own titles/sentiments this way. What fonts to you find work best? Isn't it fun! 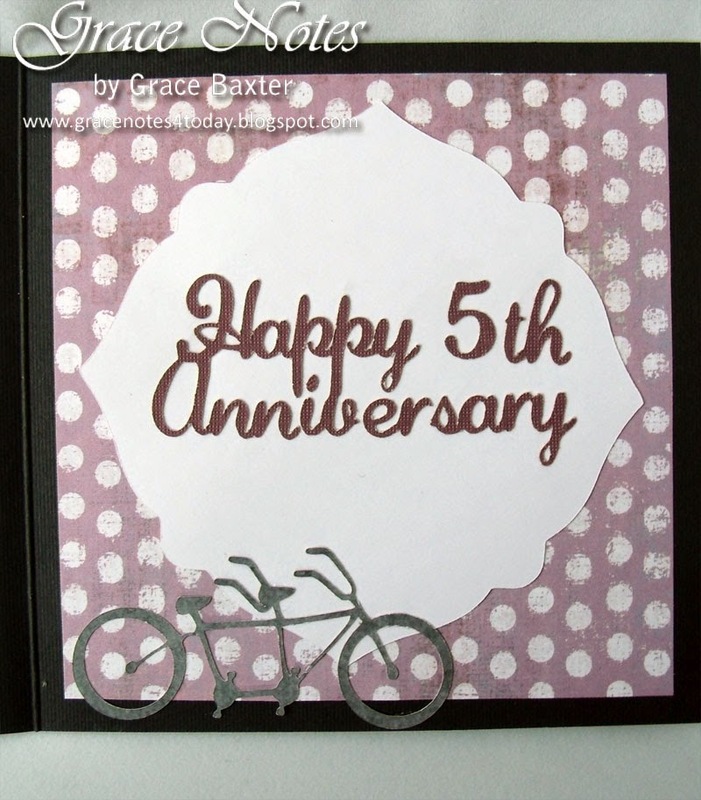 Quarter Note - "Happy 5th Anniversary"
You may also like another version of the card. This one is for a 4th Anniversary.